Microcrystalline Cellulose, Dicalcium Phosphate Dihydrate, Croscarmellose Sodium, Stearic Acid, Hydroxypropyl Cellulose, Coating (Hypromellose, Glycerin), Silicon Dioxide, Magnesium Stearate. Apple Cider Vinegar+ is produced in cGMP facilities. There are no proprietary blends, just pure ingredients. 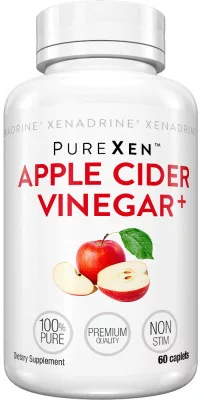 To supplement apple cider vinegar intake: Take 1 serving (2 caplets) once daily. For weight loss: Take 1 serving (2 caplets) 30 to 60 minutes before your 2 largest meals.